Carey Gabay grew up living in public housing and attending public school in the Bronx. After a successful high school career, he went on to graduate from Harvard University and Harvard Law School. He had a longstanding commitment to public service and giving back to those around him, and while at Harvard University, he ran to become the president of his undergraduate student body. More recently, he worked as an Assistant Counsel to Governor Cuomo and later as First Deputy Counsel for the Empire State Development Corporation. 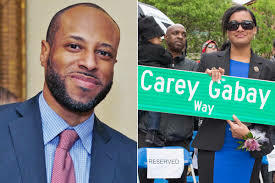 To honor the life of Carey Gabay, in May, a portion of Clinton Avenue between Willoughby and Myrtle Avenues in Brooklyn was co-named “Carey Gabay Way.” More information on the co-naming is available here.